Growing up, from the time I was about one until I was 10 my maternal grandparents lived with us. Both of my parents worked as full-time entrepreneurs that traveled and had to be at their businesses most days, so my recently retired (and young, like early 50s) grandparents often served as my second set of parents. As former high school teachers, they usually helped with homework, started dinner so that when my mom got home she could slide into mom duty a little easier, and in were built-in-babysitters when my parents were on the road. That means I have a lot of memories of time spent with them, and one of my weirdest but fondest food memory as a little kid was when they would occasionally do "The Cabbage Soup Diet". Yes, this is a real thing. You eat basically just cabbage soup, and a few other little things like eggs, for a week or 10 days. They would make big servings of this veggie-based tomato soup and I would eat it right alongside them. The only big difference was, as a little kid I was eating mine with a huge hunk of soft french bread slathered in butter because in my opinion there is almost nothing in the world more delicious than a great bowl of soup with the best bread and butter for dipping. It's a flavor that's stuck with me but I've never tried to recreate it until recently when I received red cabbage in my Imperfect Produce box and decided to ask my grandma for the recipe. I ended up tweaking it a bit based on other things I had or wanted to add to it, so instead of green peppers I added collard greens, and I omitted onion since I didn't have any. Details below! 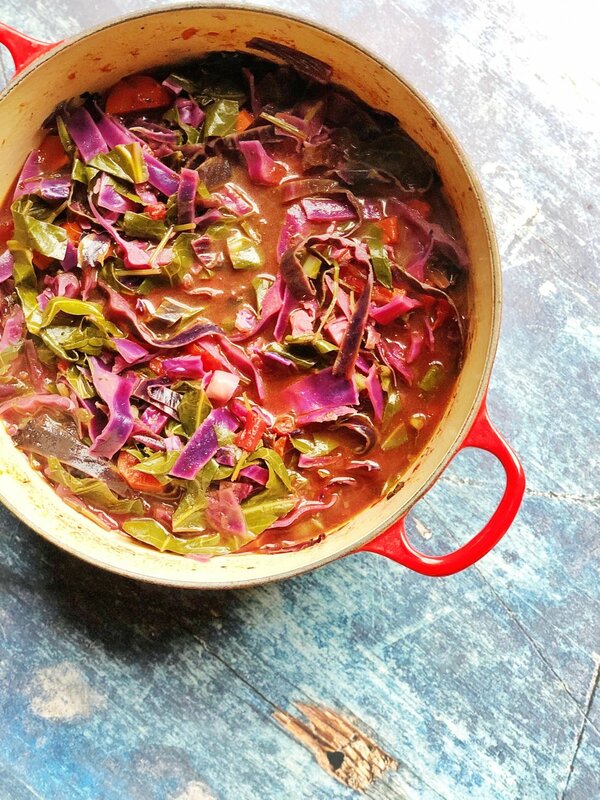 In a large & deep pot or dutch oven, saute the cabbage in oil until tender. Add the collard greens and stir, cooking until tender. They won't shrink down a lot the way that spinach does but they will wilt a little. Add the tomatoes with their juice, along with the stock and salt & pepper. Stir, bring to a simmer and cover for about 30 minutes for the flavors to develop.